6/10/11 We are saddened to report the news that Poe passed away after a long extended illness. He was deeply loved by his human guardian and we take comfort in knowing that Poe felt safe, loved and treasured. 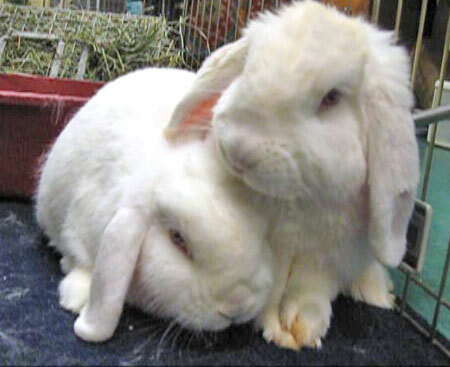 My beloved mate, Dianna, past away a few months ago and I am now living in a sanctuary foster home with my new bunny friends, Ralph and Annie. I am not available for adoption at this time. Donations are urgently needed to help me with my teeth. Hi. My name is Poe and I am named after Edgar Allen Poe, because I am a man of depth and mystery. I was surrendered to San Francisco Animal Care and Control by someone who could not provide me with the care I needed. I was sad and withdrawn for a long time until I met my bunny soul mate, Dianna. it was LOVE at first site. We adore each other and are almost always near one another and touching and snuggling. Neither of us had a particularly happy life until now and the only thing missing is a caring human who will adopt us as a bonded pair and love us for the rest of our lives. Both of us have some minor health issues and so we are listed as special needs rabbits. Dianna's teeth will need monitoring over time. She came to SaveABunny after being neglected. From a poor diet her teeth needed some correction. It is likely the problem is now over, but a wise and caring adopter will be mindful of her teeth. I was anemic and am now doing much better, but just to be safe, the folks at SaveABunny would like to make sure that Dianna and I go to a bunny-savvy home who can afford to provide medical care if needed. We love each other very much and are eager to love you too. Please visit us soon!